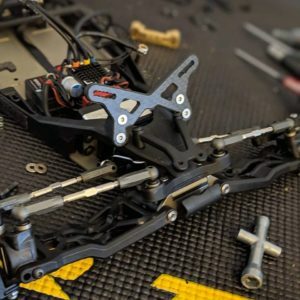 The TLR 22 5.0 +2 front shock tower is designed to provide 2mm more shock length to prevent the bottoming the suspension and causing a traction roll on "High Bite" surfaces. The shock tower is made from premium carbon fiber and has a nice 1mm chamfer to help stop the tower from digging into the dirt or carpet. we also designed the shock tower to use 4 M3X10mm Flat Head screw for that nice clean look. The tower also has one more inner half hole for your extra tuning needs.